Chelsey Golightly | Jones, Skelton & Hochuli, P.L.C. Chelsey joined Jones, Skelton & Hochuli in 2012. She practices in the areas of general civil litigation and insurance defense. 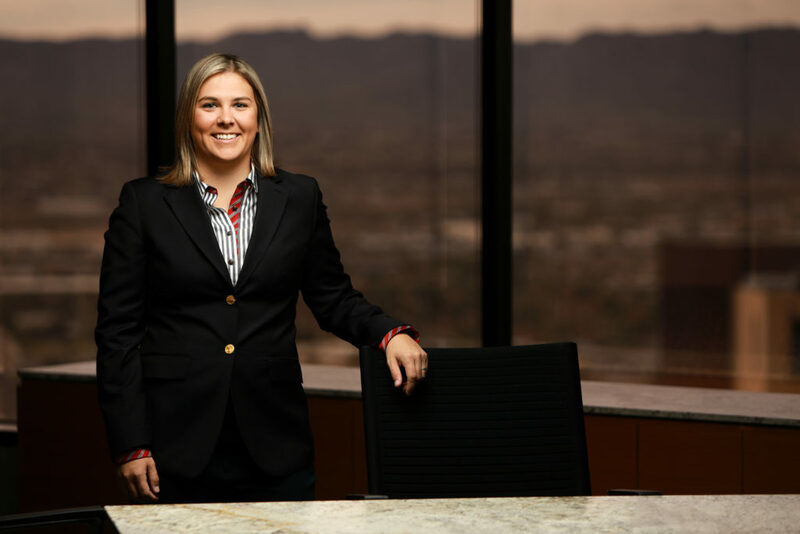 She focuses her practice on defending clients in cases involving wrongful death and catastrophic personal injury, premises liability, products liability, and social host liability. She has represented clients in complex litigation cases and has successfully taken cases to trial. She has also negotiated complicated settlements and obtained dismissals for many of her clients through motion practice. Over the past seven years, Chelsey has represented clients in various cases involving assault, battery, and self-defense. As a result, she has developed a concentration dealing with the complex interplay between criminal investigations and the onslaught of civil lawsuits that often follow. Chelsey is one of the firm’s hiring partners and oversees the summer associate program. She is also a member of the firm’s diversity and investment committees. Outside of the firm, Chelsey currently serves as the chair of social media for the Association of Defense Trial Attorneys (ADTA). She is also a member of the Fiesta Bowl Committee where she and her fellow yellow jackets raise millions of dollars per year for Arizona charities. In her spare time, she enjoys golfing, skiing, and cheering on the Michigan State Spartans with her family and friends. Defended homeowner sued for wrongful death after a shooting occurred at their property while they were on vacation in Montana. Decedent’s parents claimed the homeowners were negligent for failing to control their 21-year-old adult son who lived at home and owned firearms, and were therefore responsible for decedent’s death. The homeowners argued that because their adult son purchased the gun used to shoot decedent three days before the shooting and because he was an adult, the parents were not liable for their son’s tortious conduct. The jury found in favor of the homeowners and against the Plaintiff. Dumbrell v. Hanson, et al. Maricopa County Superior Court. Defended homeowner sued for wrongful death after a 5-year old guest who drowned in homeowner’s backyard pool. Parents claimed the homeowners were negligent for failing to designate or hire a water watcher, and were therefore responsible for their son’s drowning. As hosts, the Acosta’s argued they acted as a reasonably careful homeowner should under all the facts and circumstances. The jury found in favor of the homeowners and against the Plaintiff. Johnson v. Acosta. Maricopa County Superior Court. Defeated plaintiff’s attempt to limit exposure to the value of the vessel in maritime case. Boat capsized in high winds at Lake Powell. The decedents’ estates sued the rental company (Aramark) who rented the speedboat in bad weather. The weather forecast included a high wind advisory which Aramark failed to share with the renters. One hour after the renters left the marina, Aramark stopped renting boats for the day. The boat capsized in rough water and four passengers drowned. Aramark denied liability but pursuant to Maritime law argued their liability was limited to the value of the vessel which was less than $10,000. On behalf of the Brady’s, we successfully defeated Aramark’s attempt to limit its exposure to the value of the vessel. In re Aramark vs. the Estates and Brady, April 2014. U.S. District Court for the State of Utah. Obtained summary judgment on behalf of insurer after denial of coverage for employee theft. Plaintiff, the owner of a small business, alleged theft of amusement gaming machines from various small businesses and a storage unit. Plaintiff used Craigslist to hire several persons to run the daily operations of its business. After some time, Plaintiff noticed a substantial decrease in its profits and sent a representative to investigate these changes. After visiting the small businesses and storage unit, Plaintiff’s representative discovered that all but a few of the machines were missing. The various small business owners informed Plaintiff’s representative that the machines were removed by the persons it hired from Craigslist. Plaintiff made a claim under its insurance policy claiming the machines were stolen. The policy, however, contained an exclusion for property lost or damaged as the result of the dishonest or criminal acts by anyone to whom the property had been entrusted. The Insurer filed a Motion for Summary Judgment arguing that because the policy exclusion clearly applied, Plaintiff was not entitled to coverage under the policy. The insurer also provided evidence that it contacted Plaintiff within 24-hours of the initial claim and that it performed a reasonable and adequate investigation regarding the alleged theft. Without hearing oral argument, the US District Court agreed with the insurer and entered summary judgment in favor of the insurer. Arcade Entertainment v. AGCS Marine Insurance, April 2015. U.S. District Court for the District of Arizona.